The Olil clinic finished yesterday. Everyone who participated had a great time and learned a lot. 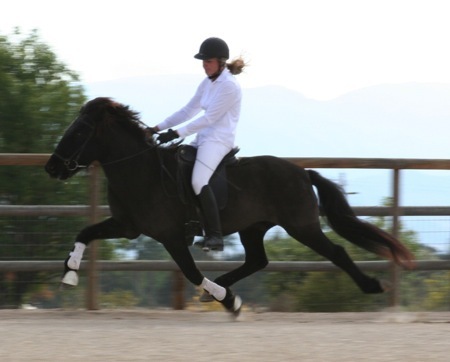 We knew Olil is a great rider and now we know she is also a fantastic teacher. This was her first Clinic in the US and we are so happy she came and we can't wait for her to come again next year. New photos added to the CIA website. It's been a busy month for us. I went to London, UK to the WorldFengur seminar on the 8th and got back on the 13th. Then after a day and a half at home Will and I went to Kentucky where Will was one of the judges at Gudmar's show. Marlise Grimm and Petur Jokull were the other 2 FEIF International Judges. Marlise was teaching at the Intern Judges seminar as well. Check out www.eldey.smugmug.com for photos from the show. CIA Open was held here October 13-14 and it was a great success. Everyone had a great time and it was so nice to see everyone here again. We had a BBQ in our barn on Friday Night and it was a lot of fun. Then on Saturday all the preliminaries were held and at the end of the day the track was opened up for the 100 m Speed Pace. There were four of us participating and we had a lot of fun. Dynur and I had the fastest time and Will and Thor had the second fastest time. Sunday we had all the finals. Thor fra Litlu-Sandvik and I had a great show and we won both T1 and V1 after a stiff competiton from Steinar and Bjarki. Thor fra Prestsbakka and I won five-gait and T2 and Will and Dreyri were 2nd in T2. 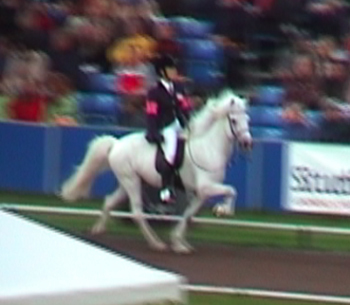 I rode Framtid in her first sport show and we got good scores for Tolt and Trot and a lot to work on for the next one. Heidi Benson took a lot of photos and has posted many of them on her website GoldminePhotography.smugmug.com. Heather Skopik a member of the LAIHA took a lot of photos also that I'm planning to post on the CIA Website this week. The G-Boots are in and we have some new colors and styles in 66N. 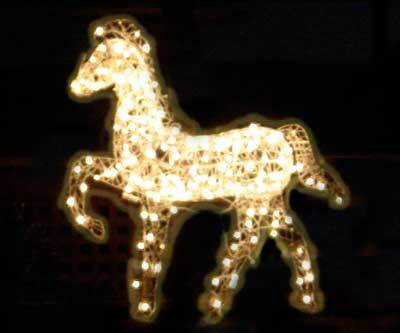 Check out our tack pages for more info. Kani arrived early this morning. He flew from Iceland to NY Friday september 21st and was released from quarantine Monday morning where he was picked up by a hauler. They stopped in Texas for few days before heading west. We look forward getting him going again but he has been on a vacation since June. We had the Burbank show in the beginning of September and we took Tjaldur, Thor fra Prestsbakka and Dreyri fra Saurbae there to compete. Will rode Dreyri in T2 and they were alone but rode for scores anyways and got 6.4 total. I rode Tjaldur in T1 and V1 and we won both preliminaries and ended second in V1 finals and won the T1 finals. Then I rode Thor in F1 and was alone so I rode for scores also and we got 6.4. It was really nice seeing all the LA people there and we wished we had a better turnout by other Californians. 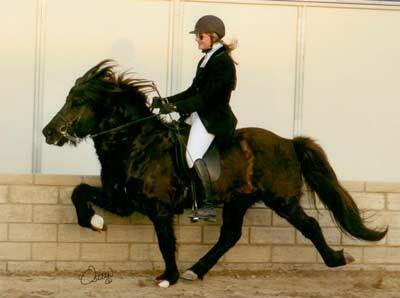 Then Will was asked to judge the first schooling show at Mountain Icelandic Horse Farm in Watsonville, CA so we went there last weekend and Anne-Marie rode Blaer there in V1 and T1 and she placed 1st in both preliminaries and finals. We had a lot of fun up there with the Kraftur people. Sara Lyter flew in from NC to scribe for Will. Then now we are getting ready for the CIA Open in 2 weeks. 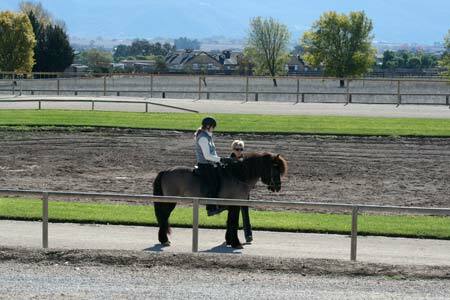 And we hope to see many riders and horses here for a fun weekend. Hörður Hákonarson is coming from Iceland to judge. 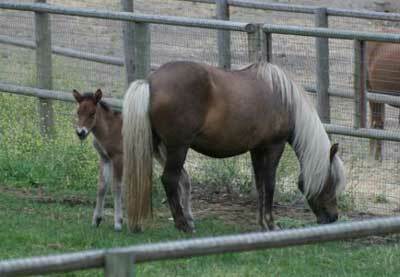 We have all the mares pregnant this year that we bred. Fjalladis is in foal by Hrafn, Gola by Tjaldur and Rak by Pegasus. Olil Amble is coming in December to have a clinic at our ranch. The dates are December 7-9. Private lessons on Friday and hopefully the clinic will be all private lessons also. Check out our events for more info. Kani left Iceland last Friday and started his journey across the country last Monday, he should arrive in Santa Ynez this weekend. My parents sent us a photo of the Kraftur son in Iceland all cozy. His dam is Oskin fra Feti who is a daughter of Gola fra Hofdabrekku and Orri fra Thufu. He was born in late July this year. Kraftur fra Bringu is the current Icelandic Champion in T1 and F1 and the current World Champion in F1 and Five-Gait combination. 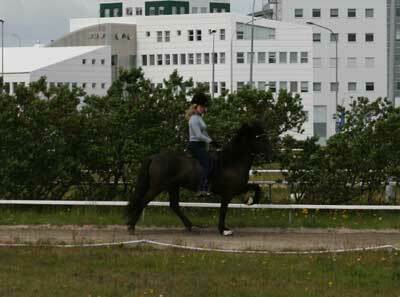 Two of Hrafn's offspring did good at the open Glitnir competiton held in Akranes this past weekend. 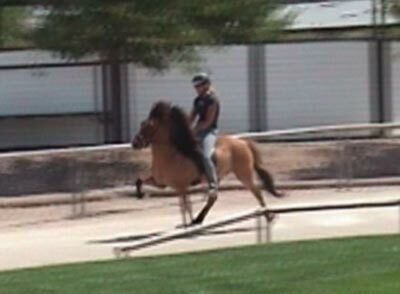 His daughter Sunna fra Sumarlidabae with a young girl riding won the youngsters fourgait and second in T2 adult class. Then Siggi Sig rode Ylur fra Akranesi in Master level fourgait and placed second. Úrslit í T2 1 flokk. 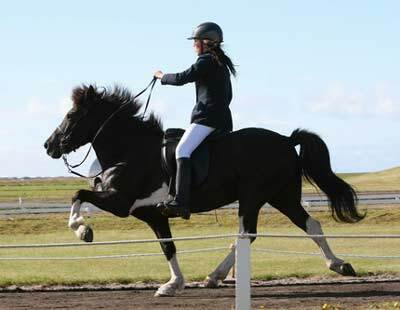 We saw at Eidfaxi.is that the Hrafn son Ylur frá Akranesi won the master level four-gait and a Hrafn daughter Sunna frá Sumarliðabæ was 3rd in T-2 open with a young rider last weekend at the annual Suðurlandsmót held at the Hella showgrounds in south-east of Iceland where Landsmot will be held next summer. We are back from the World Championships and we had a great time. Anne-Marie did very well with Huni in T2 and placed 12th, only 2 spots shy of Finals. 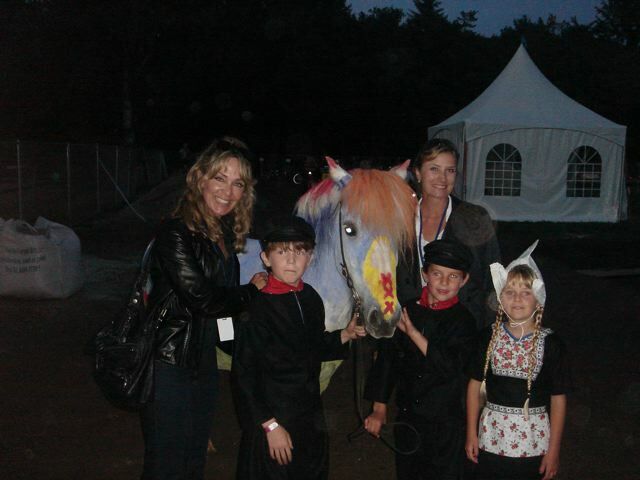 The horses traveled well to Amsterdam where we picked them up with our new Dutch friend Armet. They stayed at her farm, Álfsengi, for a week and then headed to the showgrounds where we met our team mates, Sharon, Kathy, Chrissy and Katrin. Fjalladis had her baby while we were gone. She had a filly and we are not sure if she is blue dun or yellow dun yet. 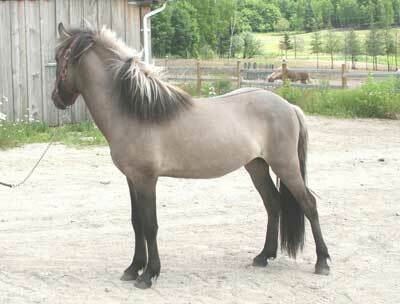 Her sire is Thor fra Prestsbakka. 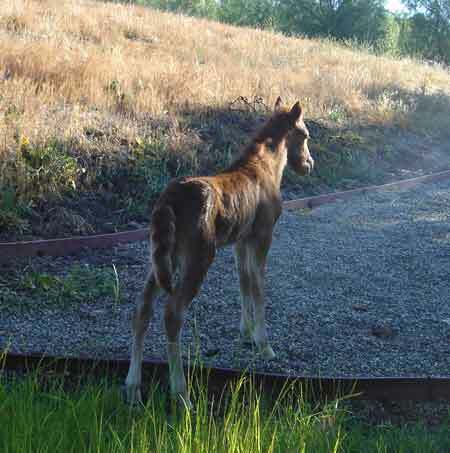 This was Fjalladis' first foal and she is really doing well. 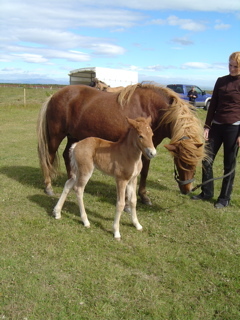 Fjöður also had a filly in Iceland. The sire is Hróður frá Refsstöðum. 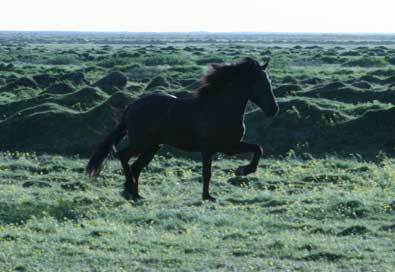 She is now being bred to Eldjárn frá Tjaldhólum. Fjalladis had a sister on the German team Fenna vom Wiesenhof. They have the same mother. Fenna was ridden by a youth rider Bernhard Podleck and made B-Finals is both T-1 and V-1. It is always fun to see relatives of the horses do well. Dynjandi's siblings also did very well. 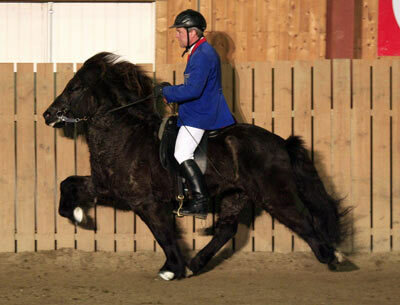 Jarl the Andvari son won T-1 and V-1 ridden by Stian Pedersen and there were many other Andvari offspring in the finals. Thor fra Prestsbakka had a brother in the B-Finals in T-1 and V-1, Jón frá Hala ridden by Chatrine Brusgaard for Denmark. 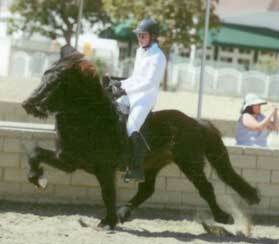 Hrafn had a daughter in the 5 year-old group that placed 4th. 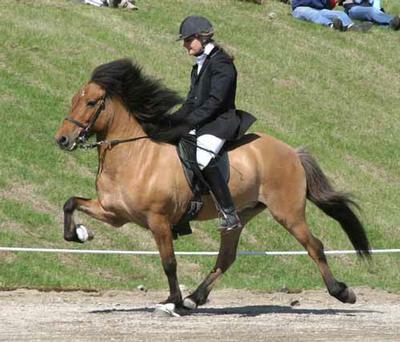 Her name is Dama van de Waaldijk ridden by Jolly Schrenk for the Netherlands. 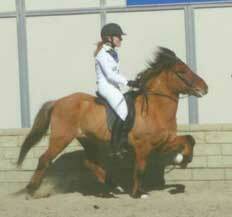 She scored 8.09 for conformation adn 7.94 for talent and a total of 8.00. Tjaldur's relatives did very well. Click here to see the full results from the WC. Click here to see more photos from the WC. The horses are leaving on Thursday and we will bhe there meeting them at the airport. Armet Tuijn at Álfsengi is so nice to let us keep our horses at her farm until we can move them to the showgrounds on August 3rd. We are really looking forward to our trip. 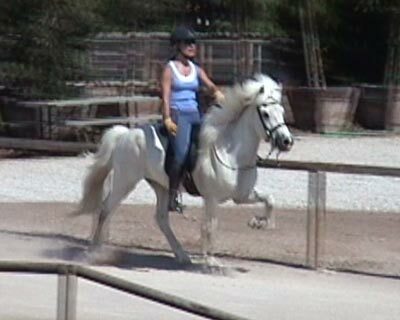 Anne-Marie and Huni in training last week. 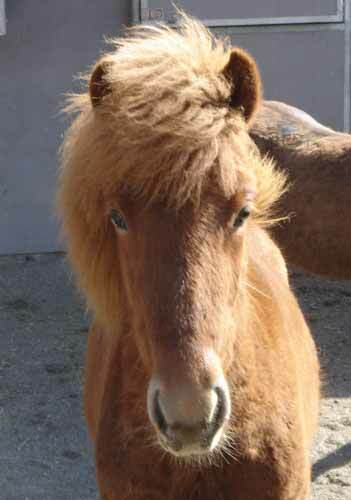 Gola's daughter Oskin had a colt in Iceland this past week. It is her first baby and he is chestnut with a star. His sire is the multiple Icelandic Champion Kraftur fra Bringu. 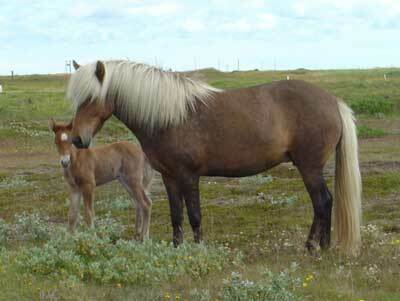 Gola had her foal in the later afternoon yesterday. 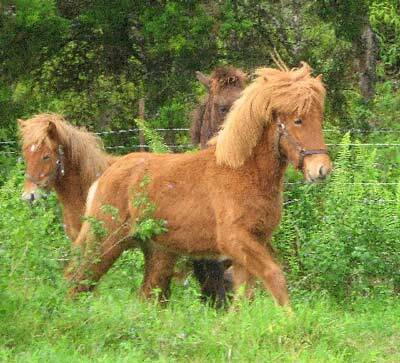 She had a bay colt and he was named Brynjar Vilmundarson since his sire is Vilmundur frá Feti the 5 year-old Landsmót winner from last year. Gola was imported in April from Iceland. She has had 6 offspring in Iceland and Brynjar is her 7th. 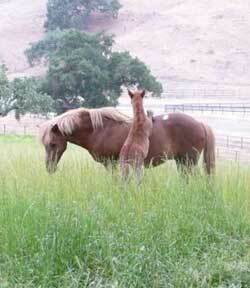 Fjalladís is due in mid August and she will be the last one to foal here in California. 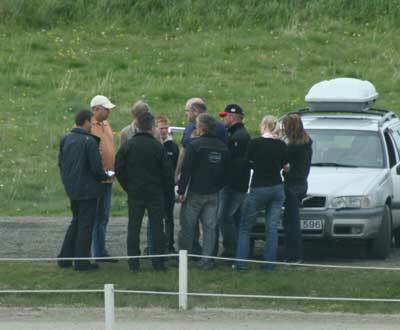 We are waiting to for Fjöður and Gola's daughter Óskin (S. Orri frá Þúfu) to foal in Iceland. Fjöður was bred to Hróður frá Refsstöðum and Óskin was bred to Kraftur fra Bringu. We look forward seeing all 3 of them play together here in California. Raudi Gandi looks like a giant next to Ali and I'm sure next to Brynjar too. He is a month and a half older than Ali and two months older than Brynjar so they have some catching up to do. Bjartur's owners took him to a young horse evaluation in Canada this past weekend and he was evaluated first prize as a young horse. One of the judges comments were "interesting young stallion"
There were only 3 young horses that scored 8.0 and over out of 22 and he was one of them! We wish Jay and Kathy Whittington of Bonaventure Farms in Ontario congratulations with their boy!! 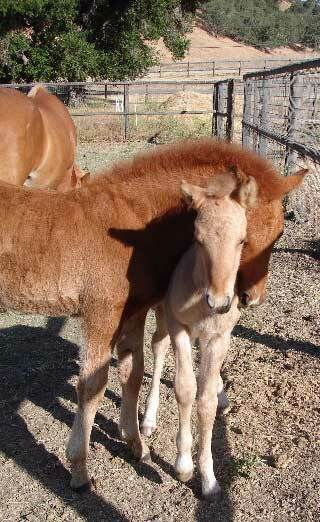 Perla had a little red dun colt this morning. She was due July 4th so he comes two weeks early. 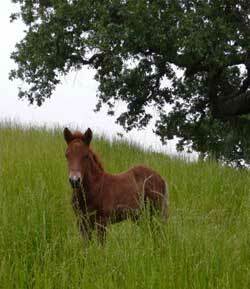 Now we are hoping Gola will foal soon too. Fjalladis is not due until mid August. All the babies born this year here in California are Anne-Marie's. Rak fra Akureyri was confirmed pregnant on Wednesday but she was bred to Pegasus fra Skyggni via A.I. We were in Iceland last weekend and just got back early this week. We had a great time watching the Icelandic Tryout where Will scribed for Hordur Hakonarson. Kraftur fra Bringu with his rider Thorarinn Eymundsson were amazing to watch and also Olil Amble and Sudri fra Holtsmula. Both are members of the Icelandic National team going to Holland this summer. 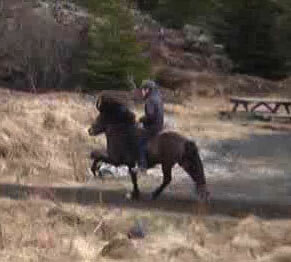 We also got a chance to see some of our horses in Iceland and Anne-Marie rode Dynjandi. Fjodur fra Asi and Oskin fra Feti should have their babies soon in Iceland. 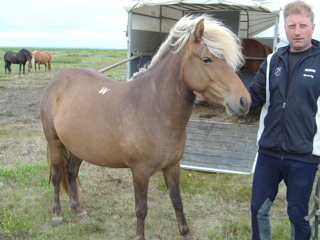 Fjodur was bred to Hrodur fra Refsstodum and Oskin was bred to the double Icelandic Champion and member of the 2007 Icelandic National team Kraftur fra Bringu. Kani fra Feti (son of Gola fra Hofdabrekku and Orri fra Thufu) was evaluated and got 10.0 for mane and tail and first prize for conformation and a total of 7.73. 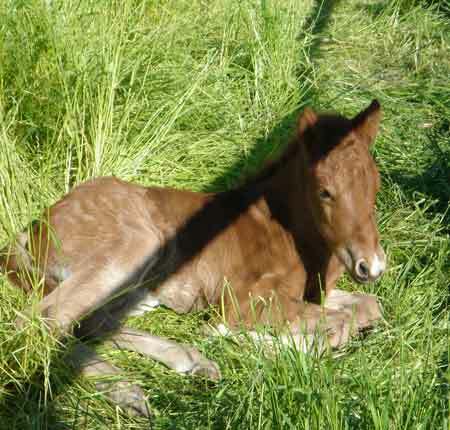 The Rak 2007 colt has been named Raudi-Gandi which means Red Horse and we thought it was appropriate being son of Stigandi. 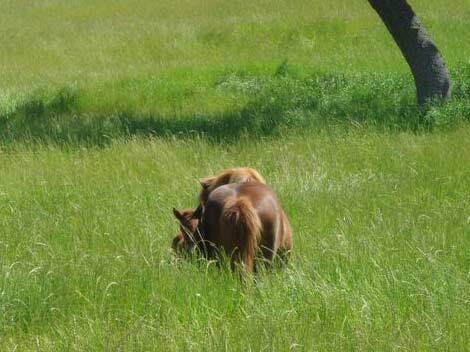 Here are two photos of him from the other day that Anne-Marie took of him playing in the field. 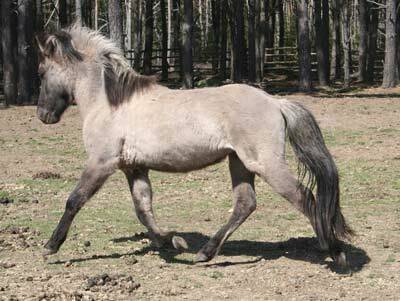 We are waiting for Gola to have her Vilmundur fra Feti foal and Perla is due to have her Thor foal in the beginning of July. Fjalladis is not due until mid August and that will be her first foal. She was bred to Thor also. 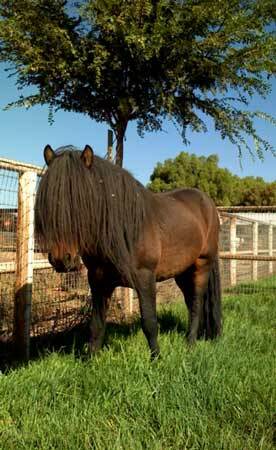 We have a new sales horse on our sales page. 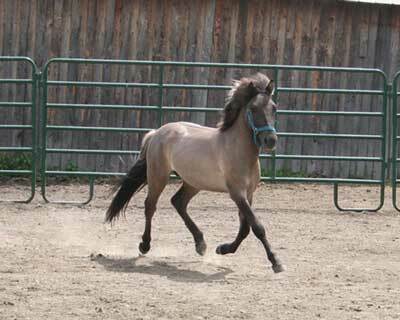 His name is Stormur fra Artunum and he is a 12 year old dark blue dun gelding. E-mail us for further info. The tryouts for the World Championships this summer in Holland finished today. All three of us made the team and we are in 1st, 2nd and 3rd place. Einar Ragnarsson was here on Thursday and that was our day to tryout. He had already judged in Wisconsin and Idaho before and left here on Friday morning for New York where he finished judging today. 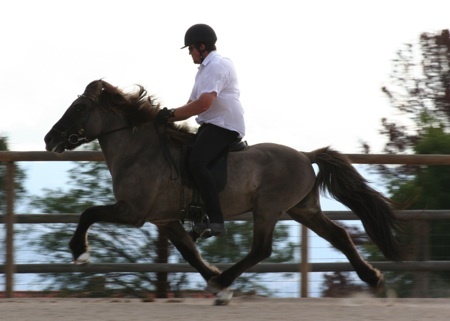 I tried out on Thor fra Litlu-Sandvik in four-gait and T1 and rode Thor fra Prestsbakka for scores only in five-gait and T2. I scored 7.20 in T1, 6.80 in four-gait. With the average of 7.00 and first place. 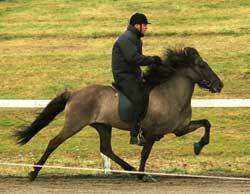 Anne-Marie tried out on Blaer fra Sigluvik and Dreyri fra Saurbae both in four-gait and T1. She scored 6.70 in T1 and 6.60 in four-gait on Blaer with the average of 6.65 and second place. She rode Huni for scores only and they received 7.20. Will tried out on Tjaldur vom Lindenhof in T1 and four-gait. He scoed 7.00 in T1 and 6.00 in four-gait with the average of 6.50 and third place. We hope to see you at the World Championships in Holland this summer! We had a great show with fantastic turnout 35 horses signed up, thanks to Valhalla Icelandics, Stina and Steinar for bringing a majority of them and also the Kraftur club members from Northern California that came. We are very happy with the turn out and hope to do it again maybe later this year. - Anne-Marie won the tolt on Blaer with a total of 7.50, I came second with a total of 7.33 and Will was 3rd with a total of 7.17. - Anne-Marie also won the T2 on Huni with the highest total of the show 7.75 and got 8.5 for loose rein. - I won the Four-gait on Thor with a total of 7.10, Anne-Marie was second with a total of 7.00 and Will was 3rd with a total of 6.60. 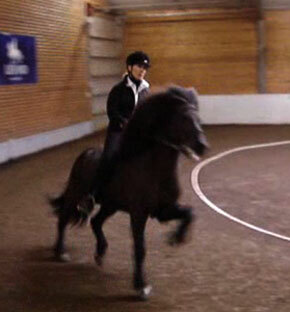 - I took Thor fra Prestsbakka in five-gait and we scored 6.79 including 7.0 for tolt and pace. Click here to see the results from the show. Johannes with the top 5 T1 winners. Then last Tuesday Rak had a colt. By the time I showed up to feed them breakfast he was up, dry and already nursing. He is a chestnut with a snip. 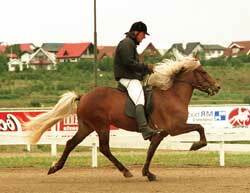 His sire is Stigandi fra Leysingjastodum and Rak was bred A.I. I will post more photos this weekend. 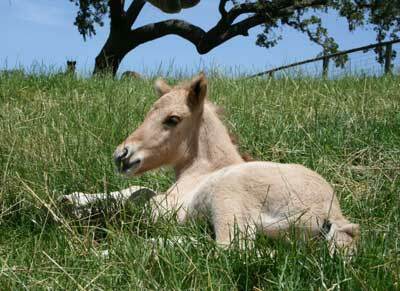 We got some updates on Perla's foals last week too. Sif went to Hawaii in April and Elouise was so nice to send us an update and is thrilled with her. The Atli clinic just finished yesterday and those who attended had a great time. Click here to see photos from the clinic. And now we are gearing up for the show this weekend here at our ranch. 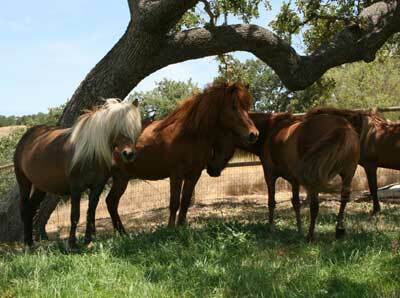 We are expecting a lot of horses from all over California. Johannes Hoyos is flying in from Austria to be our judge. He is also one of the judges for this years World Championships in August in Holland. 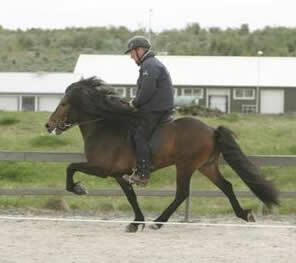 He has many years of experience with Icelandic horses as well as Saddlebred horses. at the 2003 World Championships. Then May 17th Einar Ragnarsson will be here judging the World Championships tryouts. He will start in Wisconsin then go to Idaho then here and end in New York. After the New York tryouts it will be determinate who will get to go to Holland this summer. We are looking forward to a great event and we hope you see you here this weekend! 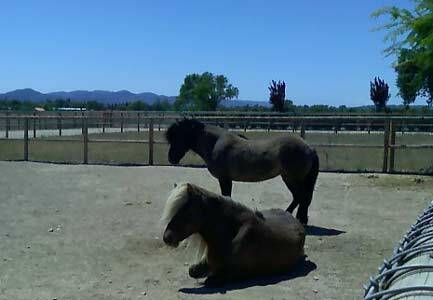 Gola and Framtid enjoying the California Sun! Gola and Framtid came to their new home yesterday and that was only hours after Sif left for her new home at Eloise home in Hawaii. She luckily didn't have to travel alone since Eloise bought a colt from David and Heidi before they moved to NY. I'm sure they are going to love their new home at the beautiful Islands of Hawaii. Aloha! Will has been in Austria for the past few days attending the FEIF judges seminar at Piet Hoyos' farm. He passed the test with flying colors and became the first North American FEIF International Judge. We couldn't be more happy and pround of this great achievment! Gola fra Hofdabrekku and Framtid fra Feti leave Iceland tomorrow and will arrive to their new home here in California next week. We are really looking forward to their arrival!! Gola is in foal with the 5 year-old Landsmot winner Vilmundur fra Feti and Framtid will be put into training and bred this year. 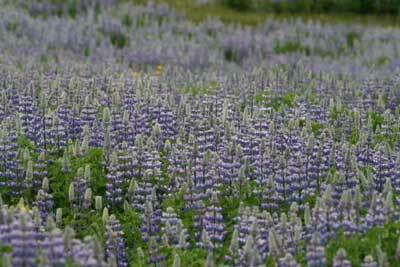 after few days in Texas for the Annual Meeting I was home for one day and went back on an airplane and flew to Iceland. 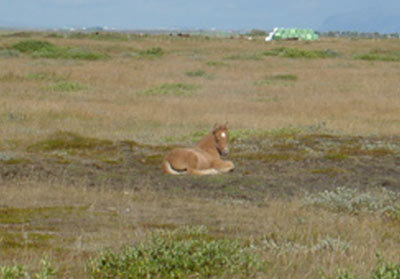 We were happy to see the progress Kani fra Feti is making, he is the first horse from the breeding in Iceland. 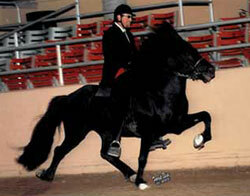 His mother Gola fra Hofdabrekku is coming to the US april 10th along with another first prize mare Framtid fra Feti. 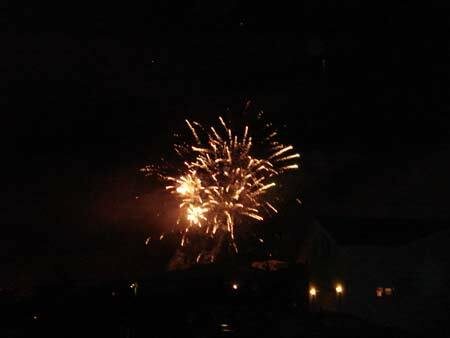 Here are some photos from Iceland and if you want to see photos from the annual meeting check out Andrea Barber's photos. Anne-Marie riding Dynjandi fra Dalvik. The Burbank Show Results have been posted on the USIHC website. We are back from the Rainbow Royal show in Burbank after a HOT weekend. Sunday was in the 90's. Anne-Marie and I took 3 horses. 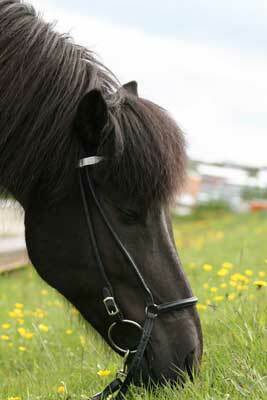 There were about 30 Icelandic Horses signed up and it was fun to see everyone again after a break in the show season. It was especailly fun to see how nice horses the kids are riding these days. I think everyone had a great time. Þorgeir Guðlaugsson came from Holland to judge. We look forward to the next show to be held here at our Ranch in May. © copyright 2007 Osteen Inc.
Anne-Marie rode Huni fra Torfunesi in T2 and Blaer fra Sigluvik in V1 and T1. 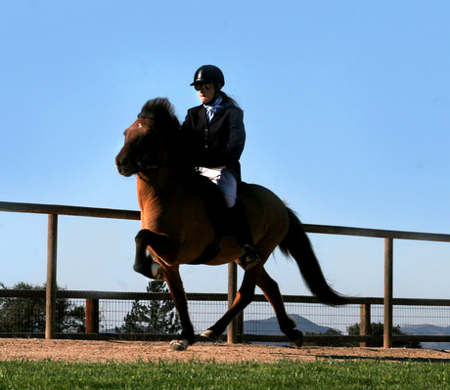 She and Huni were alone in the class but that did not stop her from riding and getting the experience of where they stand. 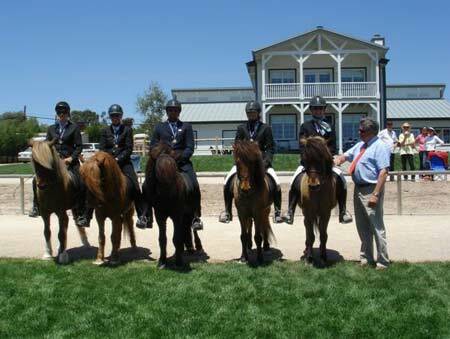 They got 7.38 in total score and 8.0 for the loose rein. She was second in T1 and V1 on Blaer in the preliminary rounds and won the V1 final with a score of 7.0 and kept her second place in T1 and scored 7.17. I rode Tjaldur vom Lindenhof in T1 and V1. We were first place in both in the preliminary rounds and I ended second to Anne-Marie in V1 with a score of 6.90 and we won the tolt with a score of 7.33. The scores will be posted on the USIHC website soon. We are hosting a show here at our ranch May 5-6 so make sure to mark your calendar. It will be a USIHC sanctioned event held on our 200m FEIF legal track. We are waiting to confirm a FEIF International Judge and as soon as that is finalized we will be posting the premium online and if you wish to get it sent to you via e-mail or snail mail contact me at asta@tolt.net. 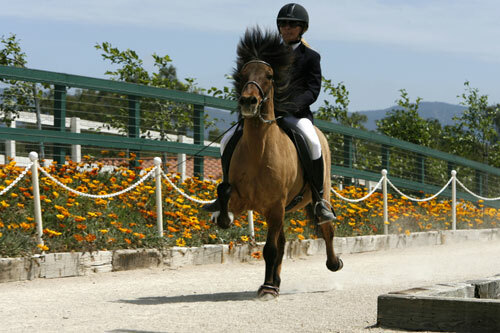 It is very convenient since Atli will be teaching a clinic here the weekend before and is avaialble to help riders interested to get ready for the show. Atli just confirmed that he is coming to Flying C Ranch to teach a clinic April 28th and 29th, 2007 Private lessons available Friday April 27th. Atli has been coming to Flying C Ranch to teach since 1998. His clinics are always full so be sure to reserve your spot in time. For more information e-mail us at asta@tolt.net or call us at 805-688-1393. Good beginning of the masters competiton for Atli this evening in Iceland. 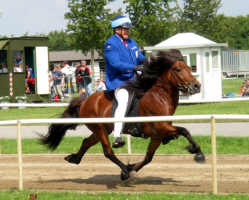 He won the four-gait on Anne-Marie's Dynjandi frá Dalvík. It wasn't an easy win for them this time. After being 6th in the preliminary rounds they won the B-Final. 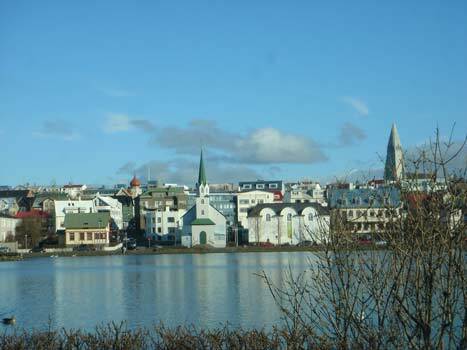 In the A-Finals they were then tied for first place with the 2004 Landsmot winner Rökkvi frá Hárlaugsstöðum and Þorvaldur Árni. They had a ride off where Atli and Dynjandi got 1st place from 4 out of 5 judges. 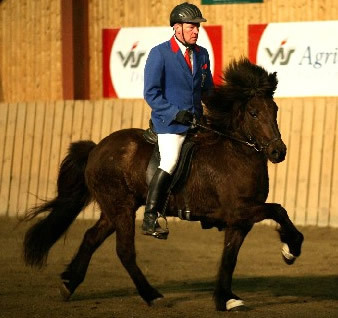 Third place was the Hrafn fra Gardabae son Ylur frá Akranesi ridden by Siggi Sig. 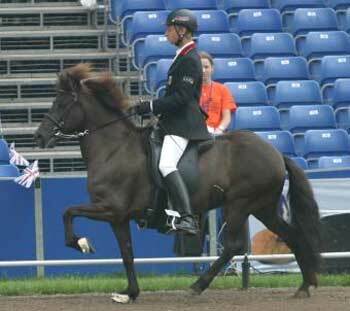 Judge will be Einar Ragnarsson and he will also be the Head Judge at the World Championships in Holland this summer.